Holidays mean decorations, which usually involve some sort of sparkle and glitter, especially if you are like this columnist (ooooh, glittery ... pretty...). The iconic decoration for the holiday season is everyone’s favorite spherical object (no, not an Oreo ball, or maybe that is just my favorite spherical object...): an ornament. 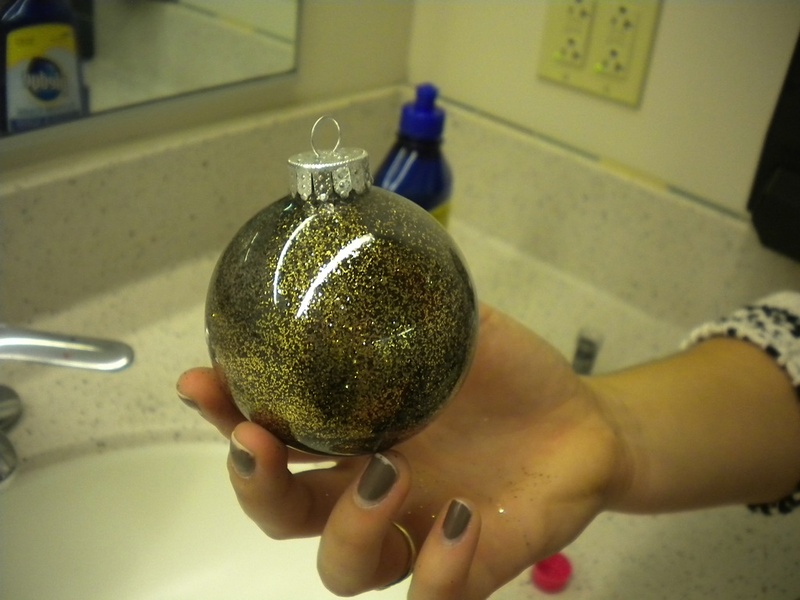 And nothing says Mizzou holiday spirit like a homemade glitter ornament. I suggest that you go to a bathroom because glitter gets everywhere, and in a bathroom you can wash it down a sink, while in your room it will just sit there and get all over EVERYTHING. Literally. 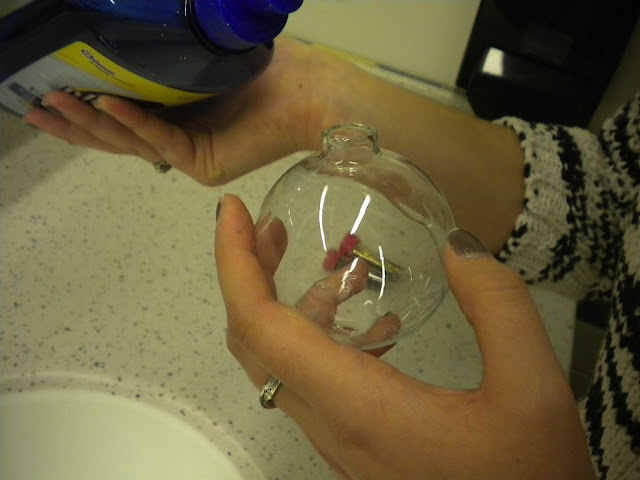 So, once you are near a sink, carefully take off the cap of the ornament. 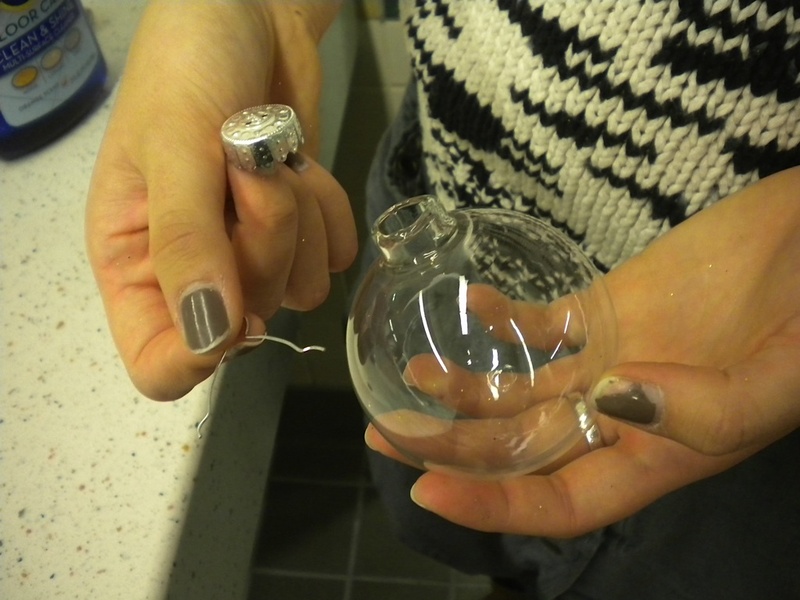 It is suggested to take off the little wire thing, too so that you can replace the cap later and then thread the wire back in so that it doesn’t scrape off the glitter, but it really doesn’t matter. Take your floor cleaner and squirt just a bit in the ornament. Now comes the wrist workout section of the craft. 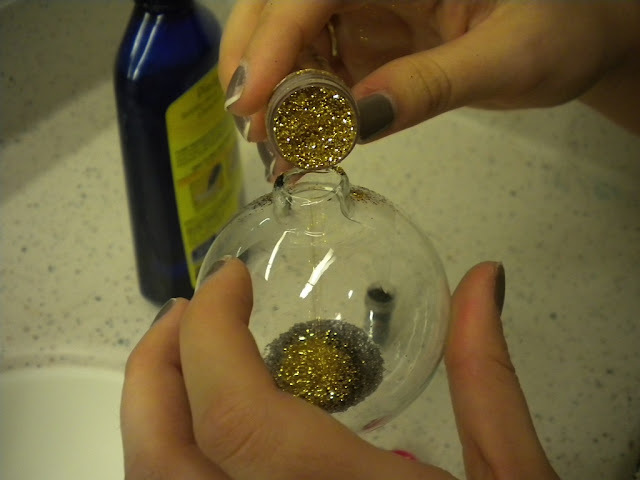 Carefully swirl the ornament with the floor cleaner in it so that the inside gets coated evenly because this will be acting as a glue of sorts for the glitter. 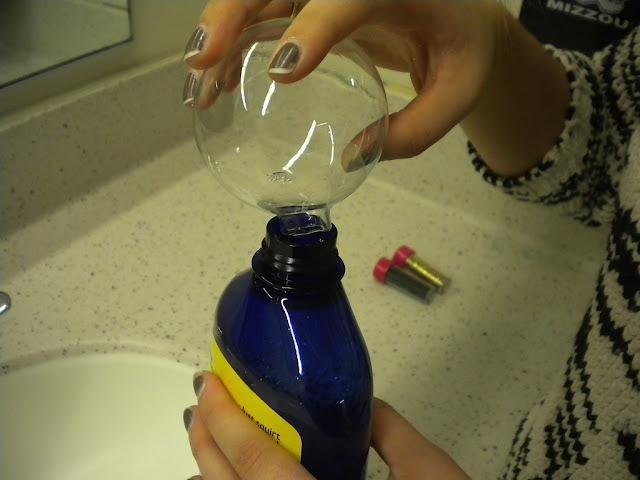 Don’t go all maraca on the ornament because that can result in spilling floor cleaner and making it all bubbly. 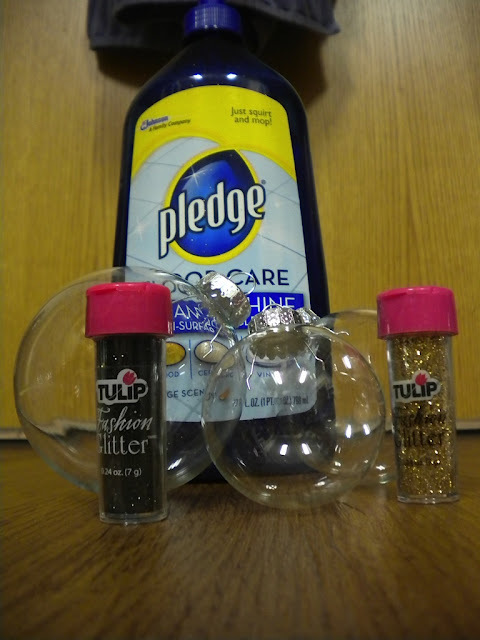 Pour most of the floor cleaner back into the bottle, but leave a little bit so that the glitter has something to start its swirling process. 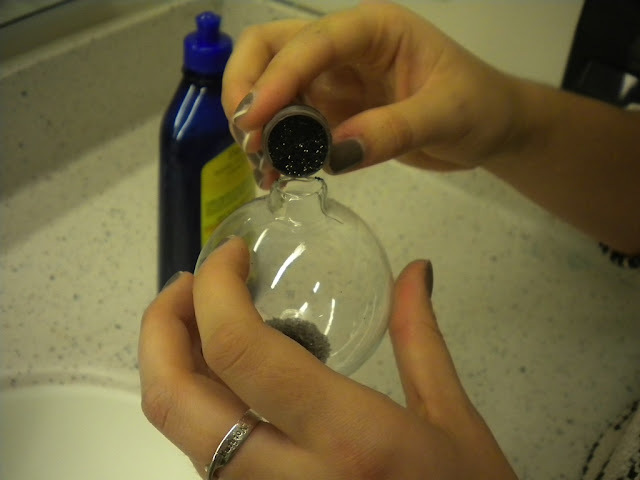 Now take the caps off the glitter tubes because leaving that little shaker cover on it will not let you pour enough glitter in at a time. 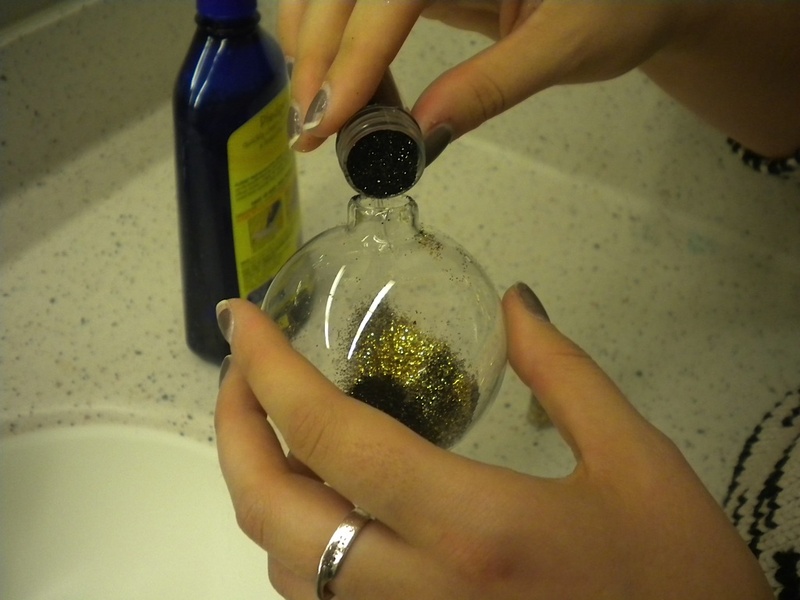 Carefully pour in a bit of glitter (I chose black and gold, ah dur, go Tigers) and swirl it similar to how you swirled the floor cleaner. Much like all my DIY’s (and everything in life), this is a guess and check process. Keep adding glitter to get the inside fully covered because you know what they say, there is no such thing as too much glitter (or maybe I just say that). Don’t blow into the ornament to try to spread the glitter because that will just result in you getting a glitter ‘stache, and No Shave November is over, folks. Once it looks fully covered, let it dry for a bit and then put on the cap and thread the little wire back through if you removed it. You will have glitter all over yourself and the bathroom counter, and if you are not into that kind of thing I don’t know what you are doing even trying to do this craft, or, for that matter, trying to craft at all because crafting is glitter in essence (I may have inhaled a bit too much glitter in this whole process). Eureka! (I am running out of exclamations). Now you have some pretty, sparkly, Mizzou-tiful holiday spirit that you can hang in your dorm, apartment, on your Christmas tree, etc. These also make great gifts because they have that cute, homemade sentiment that hopefully you still use even though you aren’t six anymore. 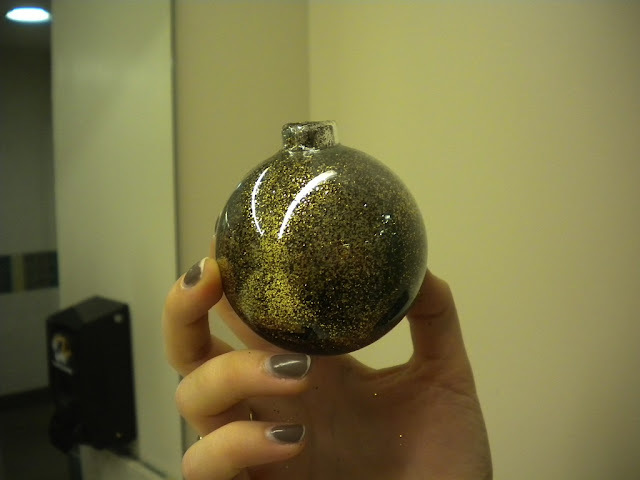 Plus, people love ornaments because they are pretty. I suggest experimenting with the 22 other colors that came with the Tulip Fashion Glitters set, and see what cool, galaxy-inspired ornaments you can make. You really can’t mess up with glitter. As always, happy crafting (and holidays! ), and go Tigers!